The Cloverfield universe — or should we say, multiverse — has now officially expanded into some wild new territory. 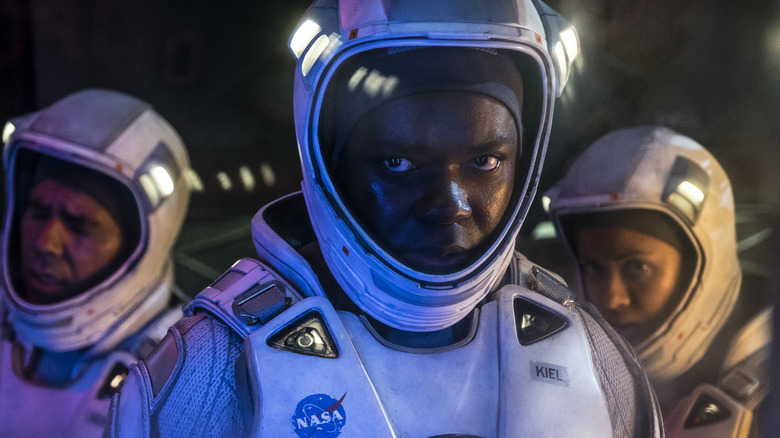 Netflix surprised fans of the sci-fi film series by dropping the third installment, The Cloverfield Paradox (formerly known as The God Particle) on Super Bowl Sunday 2018 without much warning at all. Like its predecessors, Cloverfield and 10 Cloverfield Lane, the film offers a new perspective on what has happened to cause all of those giant monsters to appear and start ravaging the Earth. 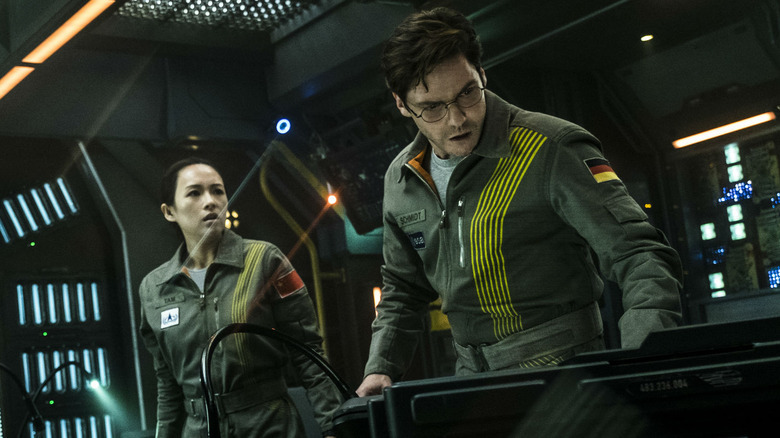 Set aboard an international space station, a crew spends two years trying to solve the world's ongoing energy crisis by testing a particle accelerator known as the Shepard, while world wars threaten to rage below over diminishing resources. Their miracle machine launch doesn't go quite as planned, however, as it rips open another dimension filled with massive demons and monsters to wreak havoc on the very planet the astronauts are trying to protect. So, how does the film tie everything together (so far), and what Easter eggs can be found floating throughout the space module? Let's take a look. As the biggest-named producer of all three films, J.J. Abrams was free to sprinkle in tons of in-references to his own life and previous works. Fans of Abrams' cinematic and small screen collection will definitely recognize the name of the gas station where Hamilton (Gugu Mbatha-Raw) and her husband Michael (Roger Davies) are waiting on line before she agrees to join the Shepard mission. It's called Kelvin, which is a brand that's appeared in a ton of Abrams' prior projects. It was the name of the man who occupied the hatch in Lost; it was the name of a spaceship in 2009's Star Trek; even Star Wars: The Force Awakens made a quick reference to a place called Kelvin Ridge. The title is a nod to Abrams' grandfather Henry Kelvin, who was very influential to his interest in movies, and he insists on including something named Kelvin in all of his projects. 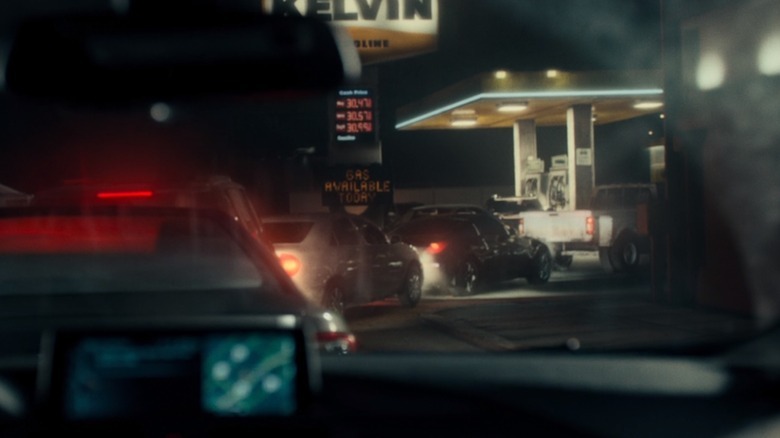 The Kelvin gas station chain previously appeared in a scene from 10 Cloverfield Lane, so it also makes sense to include it here for continuity's sake. And that's not the only bit of brand loyalty Abrams snuck into the pic, either. Another common thread found in most J.J. Abrams projects is Slusho, a fictional brand of iced drinks that seems to pop up everywhere in Abrams' universe, from his hit small screen series Alias and Fringe to Star Trek. It's also the brand that appears in the first Cloverfield film: Jason Hawkins (Mike Vogel) sports a shirt with the logo as an homage to his brother Rob's new gig with the company. But their role in the havoc that destroys the planet might be heavier than fans anticipated. 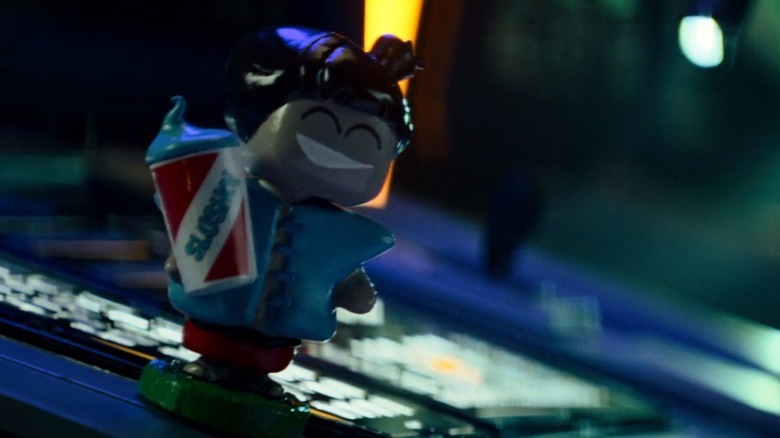 According to the in-universe lore, the Slusho brand is owned by a Japanese mining company called Tagruato, which is heavily featured in the Cloverfield Alternate Reality Game. It's said to have set up offshore rigs throughout the world's oceans that could've unleashed the sea beasts. The company name is also listed on a letter sent to Howard Stambler (John Goodman) in 10 Cloverfield Lane, which has led some Easter egg hunters to believe their drilling platforms might've opened up some kind of conduit for the original monsters to emerge through. Digital materials later revealed during the run up for 10 Cloverfield Lane offered details of Stambler's job working with satellites and the company's launch — which detail-oriented fans suspected had gone south and opened up the floodgates of monsters. However, the events of The Cloverfield Paradox seem to challenge the long-held notion that a spooky satellite or drill failure started this whole thing. Alternatively, the presence of a Slusho bobble head doll in the spaceship, along with a sighting of the actual company logo on-board, suggests that Tagruato has also been funding the Shepard project. So that means…yes, they're still totally responsible for all of this, just not in the way people thought. Perhaps instead of a falling satellite being spotted in the distance of Cloverfield's final shot, it's the escape pod from this new installment? 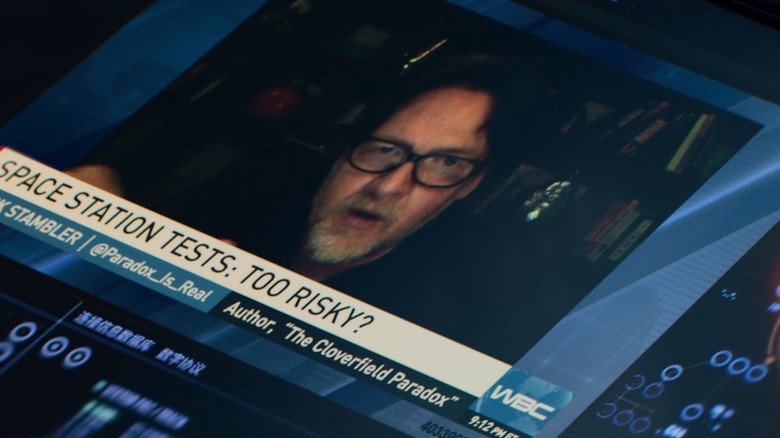 Another common thread The Cloverfield Paradox weaves with the previous sequel is the last name of the prescient conspiracy theorist showcased in the movie, Mark Stambler (Donald Logue). Yes, Stambler is the last name of Goodman's character in 10 Cloverfield Lane, and he, too, seems to have some advanced knowledge of the hellfire that would rain down on Earth. Mark Stambler appears in the film, giving a news interview about his book — which shares a title with this movie — and promoting his Twitter handle @Paradox_Is_Real (which is also real, albeit inactive). It's possible the two characters might be related, or even brothers, as it's certainly no coincidence that they are equally impassioned about their beliefs in this end-of-days event. Howard Stambler's bunker guest-slash-prisoner Emmett (John Gallagher Jr.) even makes fun of him in 10 Cloverfield Lane by saying, "You should hear his theory about mutant space worms." And that moment of levity becomes all too real in Paradox when our Russian comrade Volkov (Aksel Hennie) gets eaten from the inside out after the ship's earthworms are teleported into his body during the accidental dimensional hop. If the connection between the Stamblers wasn't clear enough, there's an even more obvious parallel drawn between them by way of actress Suzanne Cryer. 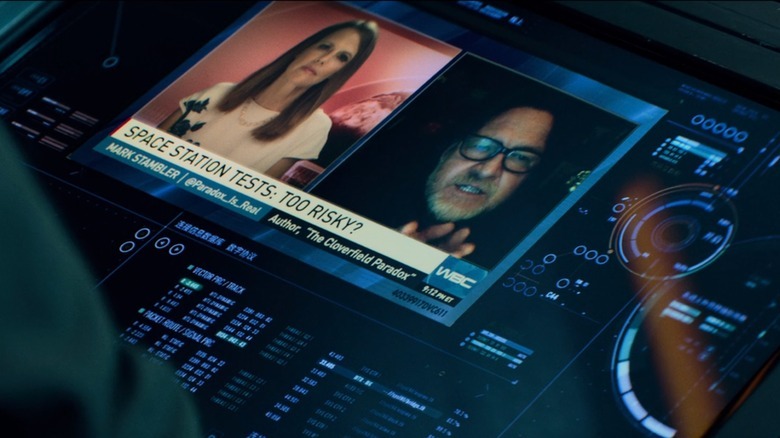 In The Cloverfield Paradox, she portrays the broadcast journalist who interviews Mark Stambler. If she looks familiar, there's a reason: She also appears briefly in 10 Cloverfield Lane as the injured woman who's desperately trying to gain entry into Howard Stambler's bunker, but isn't able to because Howard talks Michelle (Mary Elizabeth Winstead) out of letting her inside. In Paradox, she certainly isn't afraid to show her skepticism, as she snarkily asks him, "To clarify, you believe the effort to solve the world's energy crisis might unleash demons?" Considering what would befall her soon after, perhaps she should've had a more open mind about what her guest was saying there, huh? In unearthed production notes for the first film, producer J.J. Abrams, director Matt Reeves, and screenwriter Drew Goddard talked about the theories and themes that went into the film, and Abrams made this interesting comment about the Clover monster: "He's a baby. He's brand new. He's confused, disoriented and irritable. And he's been down there in the water for thousands and thousands of years." Given that Clover could level a skyscraper without even flexing, it might've been hard for fans to conceive of this creature as anything even remotely resembling a baby. But the final shot of The Cloverfield Paradox makes that very possible now. 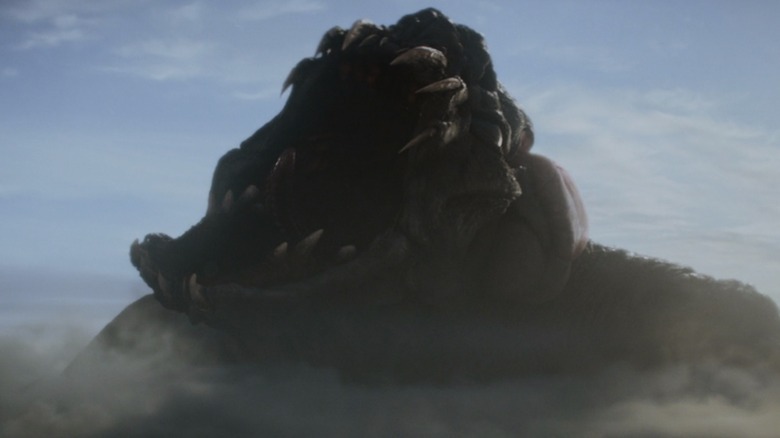 Whereas Cloverfield's Manhattan-shredding monster was as big as any building on the island, the monster that rips through the clouds in the final scene looks to be as big as some small countries. Which means they've either opened another dimension of craziness with that second Shepard overload…or Clover's mother has come out to play now, too. Mark Stambler's words during his on-air interview should've been more harrowing to everyone who watched, especially those on the space station. However, they tuned him out and got right to the job of doing exactly what he was warning against. That's because, in their minds, the mission of solving the world's energy crisis was far more pressing than reading his book to see if he was making any sense. But one thing he did say that seems important in retrospect is how wide-reaching the inter-dimensional warps of the Shepard launch would be. He told the reporter, "That accelerator is 1000 times more powerful than any ever built. Every time they test it, they risk ripping open the membrane of space time. Smashing together multiple dimensions, shattering reality, and not just on that station. Everywhere. This experiment could unleash chaos, the likes of which we have never seen. Monsters, demons, beasts from the sea … and not just here and now. In the past, in the future, in other dimensions." That certainly gives the Cloverfield movie universe unlimited room to grow — both spatially and temporally — and indeed, movie four, Overlord, is expected to center on a World War II-era encounter involving American paratroopers and a Nazi-occupied village. Stambler's suggestion that the past could be affected by their space flub seems like a clever way of keeping the film in the Cloverfield universe, too, despite hopping back in time a few decades.